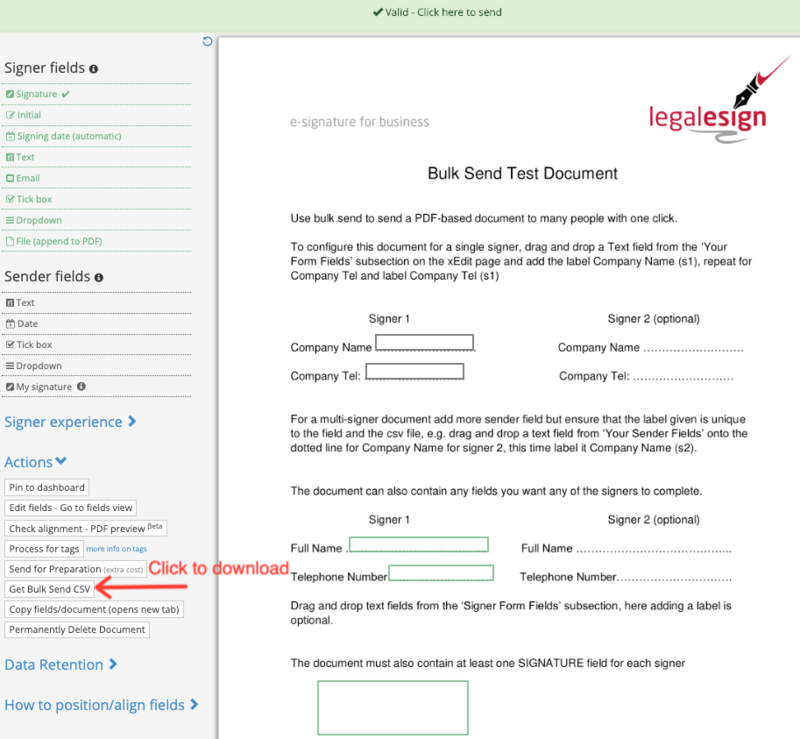 With bulk send you can send out customised PDFs to hundreds of people to esign. Ideal where you have a lot of people who you need to fill out a form or sign or approve documents en-masse. You can 'mail merge' your fields to customise your document for each signer. The bulk send accepts a CSV/XLSX of your signer details and mail merge values, matches it to the PDF document you choose and then sends out up to 500 at a time. Tip: to get a ready-formatted file suitable for bulk send, go to your document in Legalesign, click the 'Actions' header (half way down on the left) and then 'Get Bulk Send CSV'. Read down for a detailed explanation. If you use CSV it must be a comma-delimited. Check the options when saving your spreadsheet. The first row contains text headings that tell Legalesign what to do. Reserved headings are "behalf of", "attachments" and "document title" . "document title" is the name of the sent document (it cannot be set per-signer). We recommend that you use this reserved heading and use a naming convention so you can make sense of your documents later. This is particularly important where you have a significant number of documents to send. "attachments" can contain any extra static attachments you wish to add to your initial email to signers. If used, upload these documents beforehand in "Extra Email Attachments" which you will find in the "Doc options" navigation. Use exactly the same file name in your CSV as that listed in the extra email attachments section. If you want to add more than one extra attachment split the names with commas. Attachments need to be specified for each signer. If you want your draft PDF of your signing document attached then turn on this option in the 'Admin' > 'Emails' settings page. If your PDF contains Sender fields (to customize the PDF for each signer) then add each field label to the first row columns. Then fill down your custom values for each signer. Make sure sender field labels are not duplicated (go to PDF fields view to check this quickly). Multi-signer documents: For multi-signer documents the system will split the rows of the CSV to match (e.g if you have two signers in your PDF then rows 2&3, 4&5, 6&7 etc will be signers 1&2 of your doc respectively). If you have sender fields, put your sender field values in the rows for signer 1s (i.e. rows 2,4,6 etc). Due to the high volume of sending activity realtime notifications of document creation and email sending will not occur. Use the refresh link on your dashboard (circular icon to right hand side) to update the dashboard. You will notice a tickbox for 'strict validation' on the Send Bulk page. We recommend you untick this on advice of support only. Untick this where you want to leave other data on your CSV/XLSX while sending it. 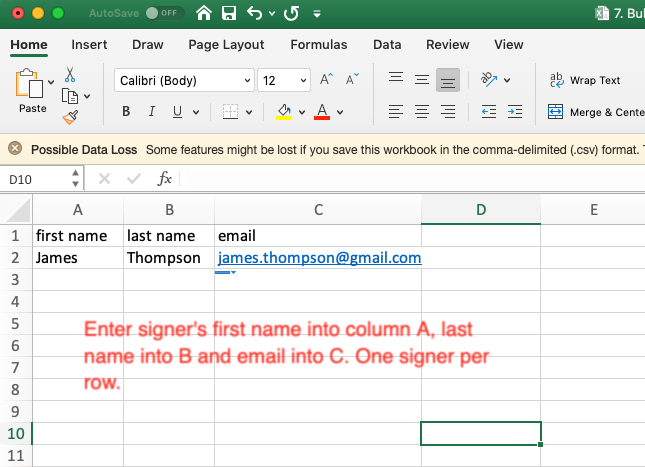 Fill down the values for each column with up to 500 signers. You can send a maximum of 500 per batch. We recommend waiting for sending to complete between batches. If this really isn't enough for you and you need bigger batches contact support. If 500 documents isn't enough for the paperwork firehose you have been forced to deal with then contact us and consider the Legalesign API.